Doha, 3 April 2019: Msheireb Downtown Doha, the smartest and most sustainable fully-built city district in the world and Qatar’s destination for leisure, living and business, will be home to the first Monoprix in Qatar with the SMART Retail Solution. 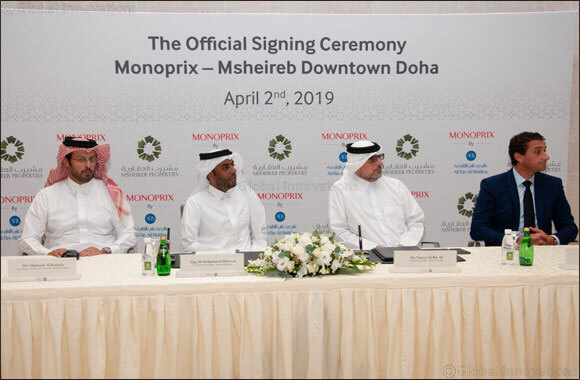 The announcement was made, last Monday, during an agreement Signing Ceremony between Msheireb Properties, the developer of Msheireb Downtown Doha (MDD), and Ali Bin Ali Holding, one of the largest conglomerates in Qatar and the owner of the Monoprix franchise in the country. The signing was also attended by Mr S�bastien Farhat, the Regional General Manager of Monoprix.